Early studies showed that ibalizumab was well tolerated and had antiviral activity against HIV strains that were resistant to other antiretrovirals. After it demonstrated modest efficacy in a previous phase 2 study, the US Food and Drug Administration (FDA) gave it orphan drug status and a breakthrough therapy designation. The study enrolled 40 heavily treatment-experienced participants. Most (85%) were men, more than half were white, the mean age was 51 years and they'd had HIV for over 20 years on average. At baseline they had a mean viral load of approximately 100,000 copies/ml and an average CD4 T-cell count of just 150 cells/mm3. About a quarter had used at least ten previous antiretrovirals and they had documented resistance to at least one drug from three antiretroviral classes. Half had exhausted all available drugs in at least three classes and 15% were resistant to all approved antiretrovirals. However, they needed to have at least one active drug available to construct an optimised background regimen; to do so 43% had to include the investigational attachment inhibitor fostemsavir. After a six-day observation period, all participants in this open-label study received a 2000mg loading dose of ibalizumab as an intravenous (IV) infusion while remaining on their failing regimen – that is, the antibody was essentially used as functional monotherapy. The primary study endpoint was the proportion of people with at least a 0.5 log10 drop in viral load by day 14. As reported at IDWeek 2016, 83% had at least a 0.5 log10 drop and 60% had a 1 log10 decrease or more at day 7. "These results support further development of PRO 140 as a simple, long-acting, single-agent maintenance therapy in selected HIV-1 patients who are experiencing antiretroviral toxicity, intolerance, or suboptimal adherence to a daily oral combination regimen," the researchers concluded, adding that they are currently trying to identify the factors that may predict good response. Lewis S et al. Long-acting ibalizumab in patients with multi-drug resistant HIV-1: a 24-week study. Conference on Retroviruses and Opportunistic Infections (CROI 2017), Seattle, abstract 449LB, 2017. Lin HH et al. Intramuscular ibalizumab: pharmacokinetics, safety, and efficacy vs IV administration. Conference on Retroviruses and Opportunistic Infections (CROI 2017), Seattle, abstract 438, 2017. Lalezari J et al. 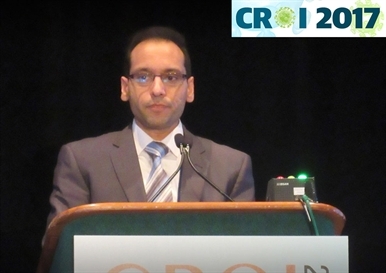 (Dhody K presenting) PRO140 single-agent maintenance therapy for HIV-1 infection: a 2-year update. Conference on Retroviruses and Opportunistic Infections (CROI 2017), Seattle, abstract 437, 2017.